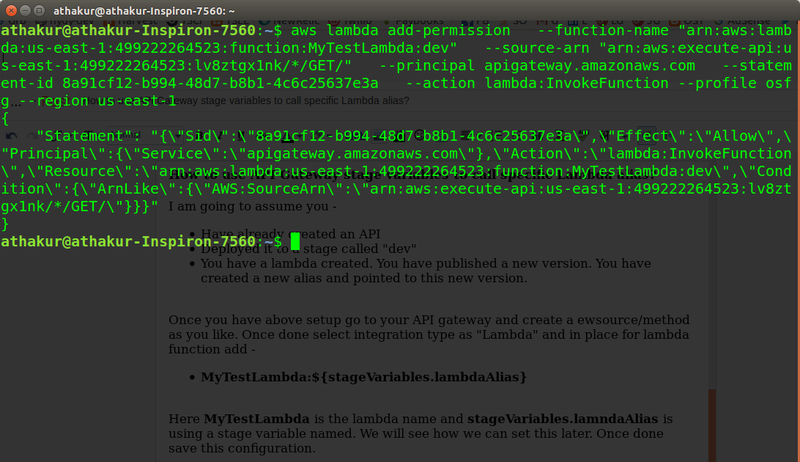 Open Source For Geeks: How to use API Gateway stage variables to call specific Lambda alias? How to use API Gateway stage variables to call specific Lambda alias? When you are using an API Gateway you create stages like for dev, QA, and production. Sometimes you might want to call different aliases of the same lambda for different stages you have created. Stage variables let you do that. Let's see how we can achieve that in this post. Deployed it to a stage called "dev"
You have a lambda created. You have published a new version. You have created a new alias and pointed to this new version. 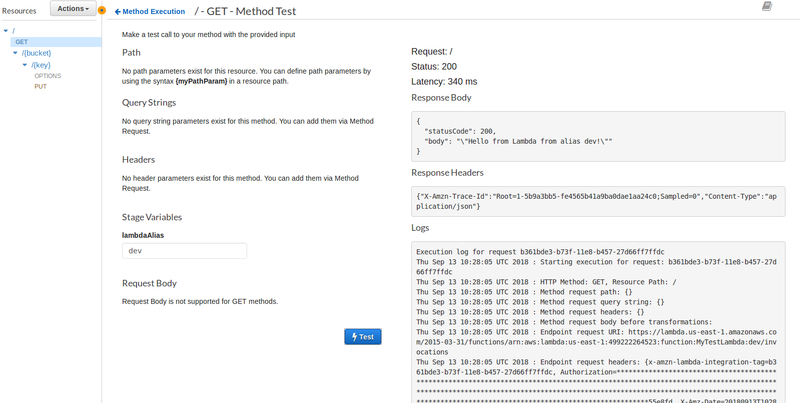 Here MyTestLambda is the lambda name and stageVariables.lamndaAlias is using a stage variable named. We will see how we can set this later. Once done save this configuration. You defined your Lambda function as a stage variable. Please ensure that you have the appropriate Function Policy on all functions you will use. You can do this by running the below AWS CLI command for each function, replacing the stage variable in the function-name parameter with the necessary function name. Execute this command in your console. NOTE: You should have aws cli configured along with a profile that corresponds to your AWS account you are trying this on. If you have multiple AWS profiles configured you might want to use --profile and --region parameters as well. See screenshot below for command and response. You can now test your method invocation with manually providing the lambdaAlias stage variable value which is "dev" in our case. You should see appropriate response once executed. Now let's see how we can add it to our actual stages. First, click on your API and deploy it to the stage you need it in, For me, I have created a stage called "dev". In this go to "Stage variables". Now create a stage variable with name "lambdaAlias" and value "dev" and save it. Now you are all set up. You can not invoke the actual API URL and you should get back the response returned by the lambda alias function.